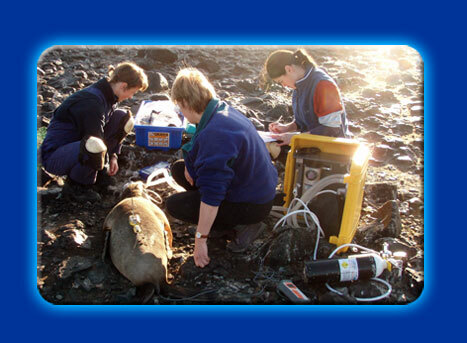 While the seal is anaesthetised scientists can measure and weigh it. Scientists put the seal on a stretcher and suspend it under some scales to get its weight. A tape measure is used to record the seals’ length and girth (how big it is around the tummy). A small, plastic tag is clipped on the back edge of each fore-flipper. Each tag has a number. The tag helps the scientist to find the seal again. Scientists often give each seal a name. This helps them to remember each seal as an individual.